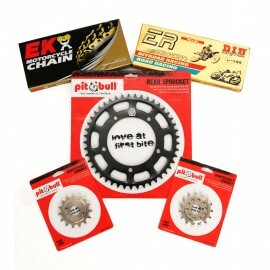 Pit Bull's chain and sprocket conversion kits combine a hard-coat anodized rear sprocket with a co.. Pit Bull case hardened, nickel-plated steel countershaft sprocket. *NOTEUse a smaller..
Case hardened, nickel plated steel countershaft. Use a smaller front sprocket for more accele.. Pit Bull Hard Anodized Aluminum Alloy Rear Sprockets. Manufactured to exact tolerances fr..
Hard Anodized Aluminum Alloy Rear Sprockets. 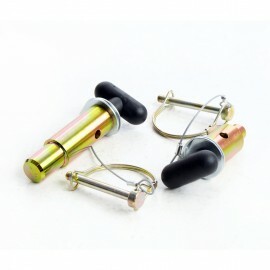 Manufactured to exact tolerances from T7075-T6 A..